This day was reserved for sightseeing around Agra. We just got lazy on this and decided to not hurry up. The end result was that we reached the Taj at 1:15 PM only. The place was crowded, I never expected it to be so crowded. 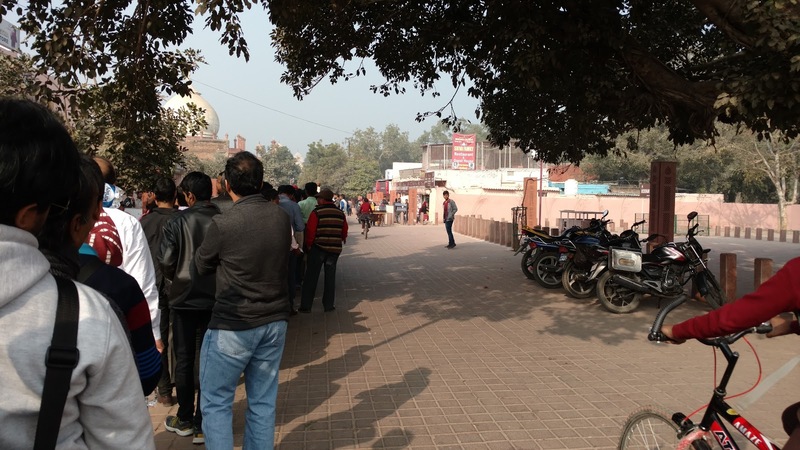 After we took the tickets and walked to the east gate of the Taj, we found that there was almost one kilometer long queue. It took us almost an hour to actually get into the Taj. After that long queue experience, once we reached inside the Taj, it was another painful experience. There was a long queue that we had to stand into to reach the platform of the Taj. We finally gave up and just took some pictures. It was too late to go to the fort that we were keep to visit, so we decided to just go back to hotel and call it a day. The moral of the story, don't go to popular historical monuments during the holiday rush.